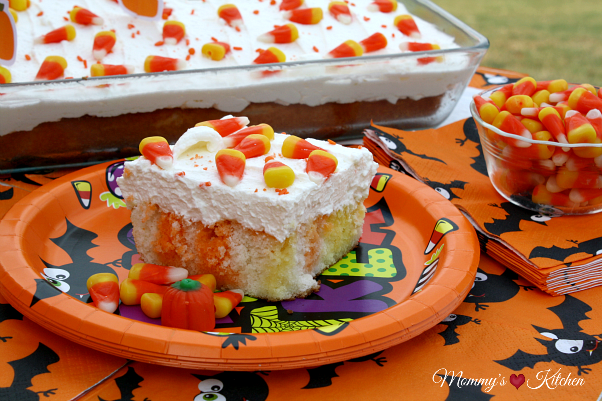 A fun candy corn inspired poke cake infused with the flavors of orange and lemon Jell-O, topped with a lightly sweetened whipped cream frosting. This is the perfect cake for Halloween! October is here, which means Halloween is just around the corner. We have about 3 weeks left until Halloween, so it's time to start thinking about all things spooky and fun! Now that my kids are older they don't go trick or treating anymore, but that doesn't mean we still can't enjoy the fun of Halloween. For my kids instead of trick or treating now it's all about dressing up, being scary, and handing out candy to the neighborhood kids. I always plan something festive for dinner to kick off Halloween, and making a yummy dessert to end the night is always a must. It's usually something easy and Halloween themed. 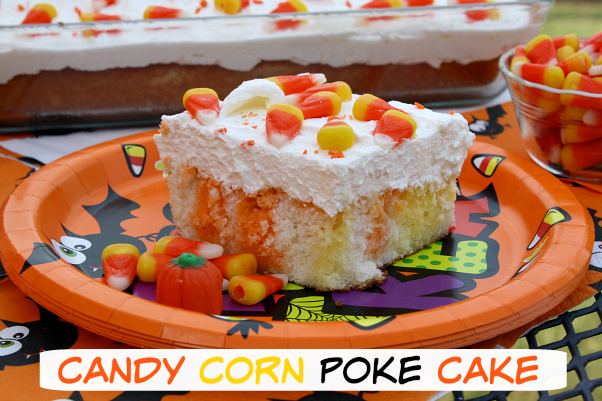 A couple days ago I decided to treat my family to an early Halloween treat with this yummy Candy Corn Poke Cake. I love a good poke cake because they're super simple to make and the flavor possibilities are endless. 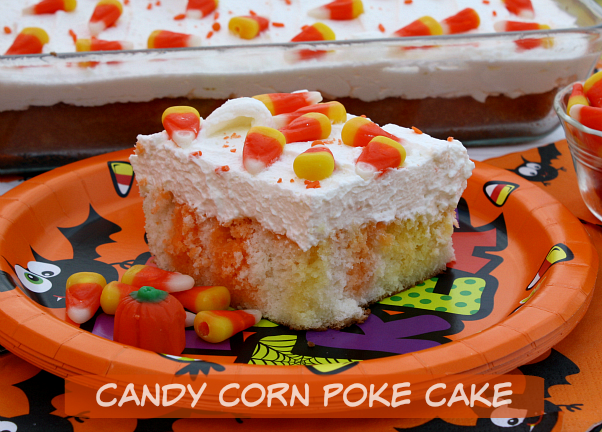 If you love candy corn or even if you don't, you'll still love this cake, because it tastes nothing like candy corn. Most candy corn cakes I've seen call for straight food coloring, but I wanted to go with something a little different. I decided on using orange and lemon Jell-O to to represent the candy corn colors, as well as flavor the cake. I have to say the orange and lemon flavor combination combined with the white cake blended together deliciously. If you're looking for a quick and impressive dessert for your upcoming Halloween or fall celebration I think this is it!!!!!!!!!!!!!! All of the ingredients you will need are simple and available at your local Walmart. 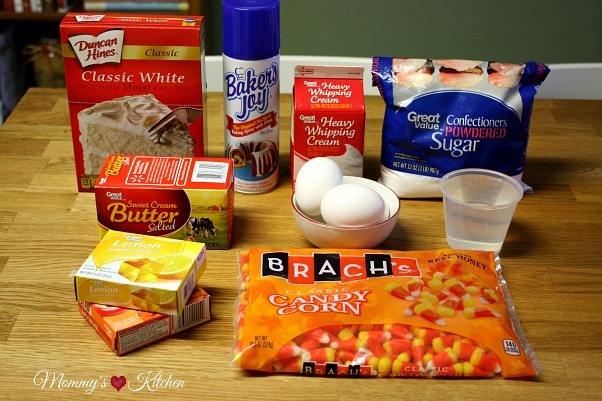 These are the ingredients you'll need: One white cake mix + the eggs, oil or butter, and water called for on boxed cake mix, floured baking spray, 1 box orange and 1 box lemon Jell-O, one cup boiling water, one cup cold water, heavy whipping cream, powdered sugar, vanilla extract, candy corn candies, and halloween or fall themed sprinkles. Prepare and bake cake according to package directions, spraying a 13 x 9 inch baking pan with non stick spray. I substituted melted butter in place of the oil called for on the box mix. Allow cake to cool about 20 minutes. Using a large fork poke holes evenly across the entire cake. Mix the orange Jell-O with 1/2 cup boiling water until dissolved. Add 1/2 cup cold water and mix until blended. Pour the orange Jell-O into every other row of fork holes (make sure to use all the gelatin) going back over the initial holes. Mix together the lemon Jell-O with the same amount of water and pour over the remaining holes. Cover cake with plastic wrap and refrigerate cake for 2-4 hours. To prepare the whipped cream frosting, start with a cold bowl. I used my Kitchen aid mixer bowl with the whisk attachment, and placed it in the freezer for about 15 minutes. Remove bowl from freezer and add 2 cups heavy cream, and set on medium speed. Turn the mixer off and finish whisking by hand with a wire whisk until the cream starts to thicken and stick to the whisk. Be careful not to whisk to hard or the cream will become clumpy. Spread the whipped cream frosting over the entire cake using an offset spatula. Refrigerate the cake at least 4 hours before serving. Add the sprinkles and the candy corn candies just before serving. Spread the whipped cream frosting over the entire cake using an offset spatula. Refrigerate the cake at least 4 hours before serving. Add the sprinkles and the candy corn candies just before serving. Store any leftovers in the refrigerator. Cook's Note: You can bake your favorite scratch white cake instead of using a cake mix, and cool whip can be substituted for the whipped cream frosting. I prefer to use real cream because this whipped frosting is the bomb. Get into the spirit of Halloween at your local Walmart. where you'll find everything you need for your spook-tacular night, costumes, party items, Halloween themed tableware, decorations, holiday recipes, candy, treats, and more. 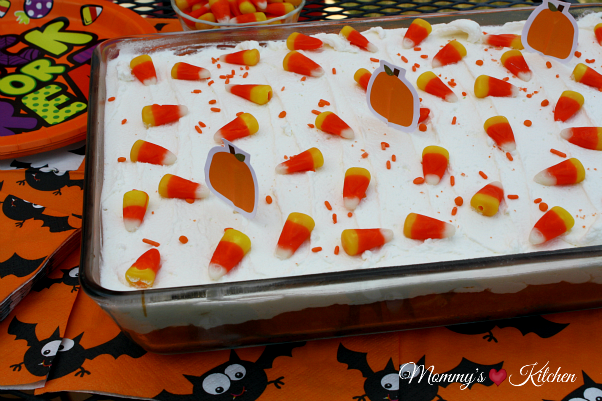 For more fun Halloween idea, check out the following recipes from Mommy's Kitchen.